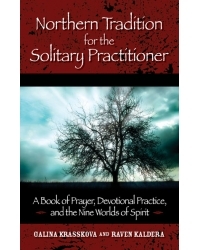 Northern Tradition for the Solitary Practitioner is a ground-breaking look at the development of devotional work within the body of polytheistic religious traditions ranging from Theodism to Asatru to Norse Paganism, that comprise the greater umbrella of the Northern Tradition. While interest in devotional and experiential work within these traditions has been growing rapidly over the past few years, this is the first book to offer an inclusive look at the diverse scope and breadth of such practices as a living, modern-day religion. It features an in-depth exploration of altar work, prayer, prayer beads, ritual work, sacred images, lore, and a thorough examination of the common core cosmology that forms the foundation of belief for the vast expanse of Northern Tradition communities. Northern Tradition for the Solitary Practitioner is not denomination-specific: rather, it seeks to provide an entry into interior practice for anyone involved in a branch of this broad family of traditions of the ancient Norse, Germanic, and Saxon peoples, using material suitable for the solitary, independent practitioner. Those outside of the Northern Tradition who wish to deepen their own devotional practice will find this book helpful in their own work, as well. Galina Krasskova is a free-range tribalist Heathen who has been a priest of Odin for more than a decade. Her primary interest is Heathen devotional work, and she has both written and lectured extensively on the subject. Krasskova is a Northern Tradition shaman currently residing in New York, where she is pursuing her masters in religious studies. She is the author of several books, including Exploring the Northern Tradition. Raven Kaldera is a Northern-Tradition Pagan shaman, diviner, homesteader, activist, founding member of the First Kingdom Church of Asphodel, and managing editor of Asphodel Press. He has written and published numerous books and articles, including Urban Primitive and the Northern-Tradition Shamanism series.